After eight months in Southeast Asia and before flying to Japan, Hong Kong has been a pleasant and smooth transition to the ultra-modern and over-regulated daily life of our developed countries. We spent a week in Hong Kong, braving the intense flow of the city and enjoying the charms of the surrounding nature. Indeed, when it comes to Hong Kong, we rather think of its skyscrapers, its crowd walking wild on the far-too-narrow pavements, its commercial billboards luring the clients on every street corner, or even of its huge number of cheap little restaurants. We think of all of that, forgetting to look beyond. Hong Kong is surrounded by woods, beaches, and peaceful islands where we can get some fresh air good for the mind and body, far enough from the tumult of the city. In a word, Hong Kong is a concrete gem nestling on a green setting. Lived in by about seven million inhabitants, Hong Kong – literally “Fragrant Harbour” –, is one of the Special Administrative Regions of the People’s Republic of China. With one of the world’s most liberal economies, it is the richest city in China, and a major financial centre and trade hub. Hong Kong was a British colony as soon as 1842, ceded back to China in 1997. However, it has kept its own currency (the Hong Kong dollar) and has its own political and legal systems. China allows this area to keep a high degree of autonomy until 2047, which means for 50 years altogether. The spoken languages are English and Cantonese, but also more and more Mandarin. In Hong Kong, we met our friend Emilie who has lived in the city for around seven years now. Funny, she is the only person who knew both of us before we even met. She shared a flat with Veronique and the stage with Erik for an opera. Emilie knows Hong Kong very well. She likes to explore and photograph every aspects of the city, both on land and under water. By the way, she regularly shares her photographs of fabulous underwater creatures on her blog Green Blue Sea. Emilie has made up a list of activities for us, long enough to occupy much more than our short one-week stay. And she has been a wonderful guide for a hike to the heights around Hong Kong. 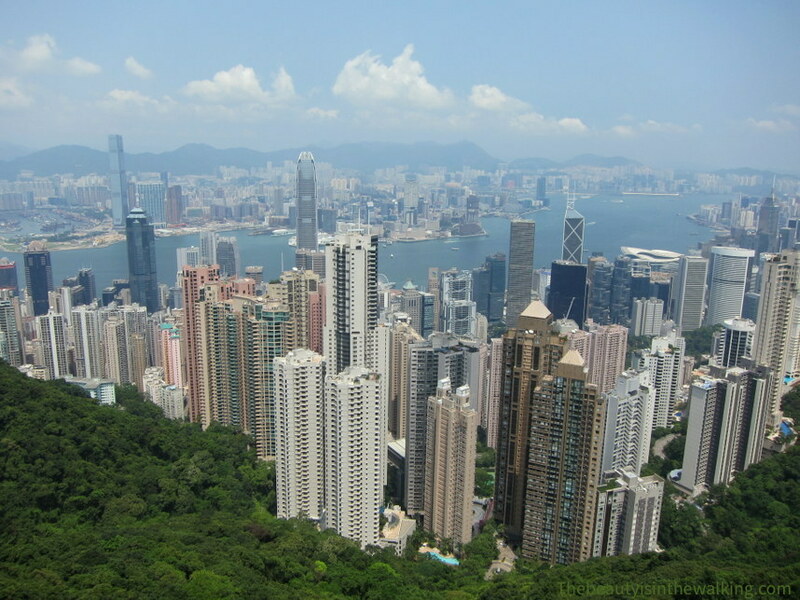 Here is a medley of activities in and around the fascinating metropolis of Hong Kong. Here are nine activities we enjoyed doing in Hong Kong, either inside the city and around. Victoria Peak is a major attraction not to be set aside when one comes to Hong Kong for the first time, especially if you want to get the hang of the size of the city and the height of its skyscrapers. This is the highest hill in Hong Kong Island (understand the main island). It is possible to walk up there if you need a dose of exercise (it’s damned steep!) or to take the old-time funicular (inaugurated in 1888! ), which is a touristic attraction of course, but plunges you into the British history. That’s what we did: we went up by the cable car (went down on foot though…), reached the Sky Terrace 428, and rented an audio guide, which we highly recommend by the way because it gives fascinating pieces of history about everything we can see from above: skyscrapers, districts, hills. Very interesting! Starting point of the funicular (called Peak Tram) on Garden Road. To get there, stop at Admiralty or Central metro stations (it’s almost located between the two), and then walk there. More visit: St Joseph Church is located a few meters up from the funicular’s departure point: a good opportunity to go and have a look! The Avenue of Stars is the perfect spot to watch Hong Kong’s skyline, which faces it. In the morning, or as we did in the evening, a beautiful light enhances the bay. As you walk along, you can read the name of Hong Kong’s movie stars and take photographs in front of the statues of famous personalities. Mongkok was certainly in our minds of new comers the most representative quarter of Hong Kong with its patchworks of commercial signs with flashy colours and flashing neon lights. The streets are crowded; everywhere, the same shops. We also go to Mongkok to walk through its long market full of stalls selling trinkets, ugly imitations and other whatnots, desperately trying to save a few dollars that we end up spending further on the way. Hong Kong is surrounded by green hills and there are many possibilities to hike easily. Moreover, the region’s public transport network is perfect and well organised. A rechargeable card named Octopus enables you to travel everywhere and take all the means of transport available in the city and towards the surrounding islands (metro, bus, tram and ferry). We went to the starting point of our walk by metro and bus. Too easy! Beacon Hill, Lion Rock, Kowloon Peak, Tung Shan, Tate’s Cairn… We did a six-hour hike on the Kowloon hills, through the woods and along the crests. In the background, we could enjoy a fantastic bluish-grey view of the city, its impressive skyscrapers, and beautiful bay. The stifling heat makes the effort even harder but the view is too nice to complain. We met a few monkeys right after the starting point, had a picnic on Lion Rock and were nearly swallowed up by the tufted hair grass on top of the impressive crests. To reach the starting point of our hike, take the metro to Shek Kip Mei Station; at the exit, take the 32M green minibus to Beacon Heights. Find out your itinerary by public transport. When arriving in Shek O, we nearly forgot we were on Hong Kong Island. It’s a totally different world. And yet, this little seaside village with a family atmosphere is located just on the other side of the Island: lovely little houses instead of breathtakingly high skyscrapers. There, you can enjoy a nice well-equipped and well-kept blond sandy beach, especially late in the afternoon when the heat is cooling down and the water is at perfect temperature. To go there, take the metro to Shau Kei Wan Station (exit A3), then take the bus 9 to Shek O at the bus station. More beaches in Hong Kong. After a beautiful day at Shek O Beach, why not have a good fish and chips with a glass of tasty wine in Stanley Harbour? A few seaside restaurants each with its own atmosphere serve dinner that you can enjoy on the terrace. Our restaurant was more into tasty cuisine and smooth music (so romantic!). We were both celebrating our birthdays, as we were born one day and a few years apart. To get to Stanley from Shek O, take bus 9 on the other direction and stop at the round about that goes down to Stanley Village. From there, take bus 14 to get there. To go back to the city (before midnight), take bus 260 that goes directly to Hong Kong Station. Situated in the southeast of Hong Kong Island, Lamma Island is the third biggest island of the region. It is mainly occupied by a few old hippies as well as families of expats who work in the city during the day and go back to enjoy the calm of the island in the evenings and on the weekends. From the Hong Kong Pier, it takes 45 minutes by ferry to reach Sok Kwu Wan Village, on the East of the Island. This is the starting point for an almost 1-hour walk along the coast towards Yung Shue Wan Village. Because it is easy and nice, many Hongkongese come here at weekends. It is possible to stop on the way for a swim on two beaches, Lo So Shing and Hung Shing Ye, which are supervised and well-equipped, with showers and changing rooms. Only the coal plant that we can see from the second beach reminds us that we aren’t far from the big city. The little extra: spend the evening to have a romantic dinner in one of the seaside restaurants. Funny enough, this park is stuck between gigantic skyscrapers and the bay. It is a nice place to have a walk or do some exercise. It is peaceful and extremely well maintained and equipped, as all the infrastructures in Hong Kong though, even if it is a rather restrictive area – no dogs, no bikes… among other “no doing this or that signs”. And so we did some yoga and tai shi for a while, together with older people in tip top form doing their daily stretching exercises. At that moment, we had a thought for “ours” that we mainly see in nice teahouses rather than on fitness trail courses. Then, we went for a walk in the streets nearby, going from one to the other, curious of everything, marvelling at the freshness of the fish in a covered market, at the unbelievably high size of the buildings, at the still genuine look of the small shops. Well, it’s all as much a true witness of Hong Kong lifestyle that has evolved between two completely different cultures. We could also tell you about staring challengingly at the void, a full glass in a hand in one of the roof top bars of the city, enjoying some delicious Asiatic black sesame and ginger flavoured desserts in one of these typical dessert restaurants, tasting the genuine Cantonese cuisine in a family restaurant, having a cold beer while seating in a park facing the bay in the coolness of the early evening, or even admiring the sunset from the pier… But of course, it is also possible to spend days in the enormous over air-conditioned malls without being afraid of having missed a lot. We told you, Hong Kong is much more than what we had imagined. Have you ever been to Hong Kong? What are your favourite places? "One doesn't discover new lands without consenting to lose sight, for a very long time, of the shore."